For other monuments dedicated to George Washington, see List of monuments dedicated to George Washington. The Washington Monument in January 2006. Location of Washington Monument in Washington, D.C.
Construction of the monument began in 1848, and was halted from 1854 to 1877 due to a lack of funds, a struggle for control over the Washington National Monument Society, and the intervention of the American Civil War. Although the stone structure was completed in 1884, internal ironwork, the knoll, and other finishing touches were not completed until 1888. A difference in shading of the marble, visible approximately 150 feet (46 m) or 27% up, shows where construction was halted and later resumed with marble from a different source. The original design was by Robert Mills, but he did not include his proposed colonnade due to a lack of funds, proceeding only with a bare obelisk. Despite many proposals to embellish the obelisk, only its original flat top was altered to a pointed marble pyramidion, in 1884. The cornerstone was laid on July 4, 1848; the first stone was laid atop the unfinished stump on August 7, 1880; the capstone was set on December 6, 1884; the completed monument was dedicated on February 21, 1885; and officially opened October 9, 1888. Upon completion, it became the world’s tallest structure, a title previously held by the Cologne Cathedral. The monument held this designation until 1889, when the Eiffel Tower was completed in Paris, France. As of September 2016, the monument has been closed indefinitely due to reliability issues with the current elevator system. On December 2, 2016, the National Park Service announced that the monument would be closed until 2019 in order to modernize the elevator. The $2 to 3 million project will correct the elevator’s ongoing mechanical, electrical and computer issues, which have shuttered the monument since August 17. The National Park Service has also requested funding in its FY 2017 President’s Budget Request to construct a permanent screening facility for the Washington Monument. The Washington Monument is expected to re-open to visitors in 2019. At his death in 1799 he left a critical legacy; he exemplified the core ideals of the American Revolution and the new nation: republican virtue and devotion to civic duty. Washington was the unchallenged public icon of American military and civic patriotism. He was also identified with the Federalist Party, which lost control of the national government in 1800 to the Jeffersonian Republicans, who were reluctant to celebrate the hero of the opposition party. Starting with victory in the Revolution, there were many proposals to build a monument to Washington. After his death, Congress authorized a suitable memorial in the national capital, but the decision was reversed when the Democratic-Republican Party (Jeffersonian Republicans) took control of Congress in 1801. The Republicans were dismayed that Washington had become the symbol of the Federalist Party; furthermore the values of Republicanism seemed hostile to the idea of building monuments to powerful men. They also blocked his image on coins or the celebration of his birthday. Further political squabbling, along with the North-South division on the Civil War, blocked the completion of the Washington Monument until the late 19th century. By that time, Washington had the image of a national hero who could be celebrated by both North and South, and memorials to him were no longer controversial. As early as 1783, the Continental Congress had resolved “That an equestrian statue of George Washington be erected at the place where the residence of Congress shall be established.” The proposal called for engraving on the statue which explained it had been erected “in honor of George Washington, the illustrious Commander-in-Chief of the Armies of the United States of America during the war which vindicated and secured their liberty, sovereignty, and independence.”Currently, there are two equestrian statues of President Washington in Washington, D.C. One is located in Washington Circle at the intersection of the Foggy Bottom and West End neighborhoods at the north end of the George Washington University, and the other is in the gardens of the National Cathedral. Ten days after Washington’s death, a Congressional committee recommended a different type of monument. John Marshall, a Representative from Virginia (who later became Chief Justice of the Supreme Court) proposed that a tomb be erected within the Capitol. However, a lack of funds, disagreement over what type of memorial would best honor the country’s first president, and the Washington family’s reluctance to move his body prevented progress on any project. It is proposed that the contemplated monument shall be like him in whose honor it is to be constructed, unparalleled in the world, and commensurate with the gratitude, liberality, and patriotism of the people by whom it is to be erected … [It] should blend stupendousness with elegance, and be of such magnitude and beauty as to be an object of pride to the American people, and of admiration to all who see it. Its material is intended to be wholly American, and to be of marble and granite brought from each state, that each state may participate in the glory of contributing material as well as in funds to its construction. The society held a competition for designs in 1836. The winner was architect Robert Mills. The citizens of Baltimore had chosen him to build a monument to Washington, and he had designed a tall Greek column surmounted by a statue of the President. Mills also knew the capital well, having just been chosen Architect of Public Buildings for Washington. His design called for a tall obelisk—an upright, four-sided pillar that tapers as it rises—with a nearly flat top. He surrounded the obelisk with a circular colonnade, the top of which would feature Washington standing in a chariot. Inside the colonnade would be statues of 30 prominent Revolutionary War heroes. One part of Mills’ elaborate design that was built was the doorway surmounted by an Egyptian-style winged sun. It was removed in 1885, after the monument was dedicated. A photo can be seen in The Egyptian Revival by Richard G. Carrot. The Washington Monument was originally intended to be located at the point at which a line running directly south from the center of the White House crossed a line running directly west from the center of the Capitol. Pierre (Peter) Charles L’Enfant‘s 1791 “Plan of the city intended for the permanent seat of the government of the United States …” designated this point as the location of the equestrian statue of George Washington that the Continental Congress had voted for in 1783. [n 4] The ground at the intended location proved to be too unstable to support a structure as heavy as the planned obelisk. At that originally intended site, which is 390 feet (119 m) WNW from the current monument, there now stands a small monolith called the Jefferson Pier. No more Washingtons shall come in our time … But his virtues are stamped on the heart of mankind. He who is great in the battlefield looks upward to the generalship of Washington. He who grows wise in counsel feels that he is imitating Washington. He who can resign power against the wishes of a people, has in his eye the bright example of Washington. Two years later, on a torrid July 4, 1850, George Washington Parke Custis, the adopted son of George Washington and grandson of Martha Washington, dedicated a stone from the people of the District of Columbia to the Monument at a ceremony that President Zachary Taylor attended five days before he died from food poisoning. Interest in the monument grew after the Civil War. Engineers studied the foundation several times to determine if it was strong enough. In 1876, the Centennial of the Declaration of Independence, Congress agreed to appropriate another $200,000 to resume construction. This attitude led people to submit alternative designs. Both the Washington National Monument Society and Congress held discussions about how the monument should be finished. The society considered five new designs, concluding that the one by William Wetmore Story seemed “vastly superior in artistic taste and beauty.” Congress deliberated over those five as well as Mills’ original. While it was deciding, it ordered work on the obelisk to continue. Finally, the members of the society agreed to abandon the colonnade and alter the obelisk so it conformed to classical Egyptian proportions. Construction resumed in 1879 under the direction of Lieutenant Colonel Thomas Lincoln Casey of the U.S. Army Corps of Engineers. Casey redesigned the foundation, strengthening it so it could support a structure that ultimately weighed more than 40,000 tons. He then followed the society’s orders and figured out what to do with the memorial stones that had accumulated. Though many people ridiculed them, Casey managed to install most of the stones in the interior walls — one stone was found at the bottom of the elevator shaft in 1951. The bottom third of the monument is a slightly lighter shade than the rest of the construction because the marble was obtained from different quarries. The building of the monument proceeded quickly after Congress had provided sufficient funding. In four years, it was completed, with the 100-ounce (2.83 kg) aluminum apex/lightning-rod being put in place on December 6, 1884. The apex was the largest single piece of aluminum cast at the time, when aluminum commanded a price comparable to silver. Two years later, the Hall–Héroult process made aluminum easier to produce and the price of aluminum plummeted, making the once-valuable apex more ordinary, though it still provided a lustrous, non-rusting apex that served as the original lightning rod. The monument opened to the public on October 9, 1888. I do now …. in behalf of the people, receive this monument …. and declare it dedicated from this time forth to the immortal name and memory of George Washington. 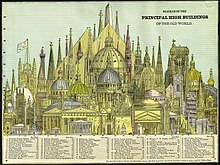 Diagram of the Principal High Buildings of the Old World, 1884. The Washington Monument is the tallest structure represented. At the time of its completion, it was the tallest building in the world, a title it retained until the Eiffel Tower was completed in 1889. Although several taller masonry structures were constructed during the 20th-century, all were demolished except for the Anaconda Smelter Stack in Montana at 585 feet (178 m) (made of brick, not stone). [n 3] It is the tallest building in Washington, D.C. The Heights of Buildings Act of 1910 restricts new building heights to no more than 20 feet (6.1 m) greater than the width of the adjacent street. This monument is vastly taller than the obelisks around the capitals of Europe and in Egypt and Ethiopia, but ordinary antique obelisks were quarried as a monolithic block of stone, and were therefore seldom taller than approximately 100 feet (30 m). The Washington Monument attracted enormous crowds before it officially opened. For six months after its dedication, 10,041 people climbed the 898 steps and 50 landings to the top. After the elevator that had been used to raise building materials was altered to carry passengers, the number of visitors grew rapidly, and an average of 55,000 people per month were going to the top by 1888. The annual visitor count peaked between 1979 and 1997, where an average of 1.1 million visitors visited annually; however, from 2005 to 2010, the Washington Monument has had an average of only 631,000 visitors each year. As with all historic areas administered by the National Park Service, the national memorial was listed on the National Register of Historic Places on October 15, 1966. In the early 1900s, material started oozing out between the outer stones of the first construction period below the 150-foot mark, and was referred to by tourists as “geological tuberculosis”. This was caused by the weathering of the cement and rubble filler between the outer and inner walls. As the lower section of the monument was exposed to cold and hot and damp and dry weather conditions, the material dissolved and worked its way through the cracks between the stones of the outer wall, solidifying as it dripped down their outer surface. For ten hours in December 1982, the Washington Monument and eight tourists were held hostage by a nuclear arms protester, Norman Mayer, claiming to have explosives in a van he drove to the monument’s base. U.S. Park Police shot and killed Mayer. The monument was undamaged in the incident, and it was discovered later that Mayer did not have explosives. After this incident, the surrounding grounds were modified in places to restrict the possible unauthorized approach of motor vehicles. The monument underwent an extensive restoration project between 1998 and 2001. During this time it was completely covered in scaffolding designed by the American architect Michael Graves (who was also responsible for the interior changes). The project included cleaning, repairing and repointing the monument’s exterior and interior stonework. The stone in publicly accessible interior spaces was encased in glass to prevent vandalism, while new windows with narrower frames were installed (to increase the viewing space). New exhibits celebrating the life of George Washington, and the monument’s place in history, were also added. A temporary interactive visitors center, dubbed the “Discovery Channel Center” was also constructed during the project. The center provided a simulated ride to the top of the monument, and shared information with visitors during phases in which the monument was closed. The majority of the project’s phases were completed by summer 2000, allowing the monument to reopen July 31, 2000. 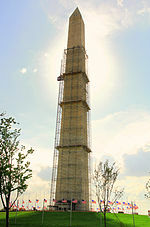 The monument temporarily closed again on December 4, 2000 to allow a new elevator cab to be installed, completing the final phase of the restoration project. The new cab included glass windows, allowing visitors to see some of the 194 memorial stones embedded in the monument’s walls. The installation of the cab took much longer than anticipated, and the monument did not reopen until February 22, 2002. The final cost of the restoration project was $10.5 million. On September 7, 2004 the monument closed for a $15 million renovation, which included numerous security upgrades and redesign of the monument grounds by landscape architect Laurie Olin. The renovations were due partly to security concerns following the September 11 attacks and the start of the War on Terror. The monument reopened April 1, 2005, while the surrounding grounds remained closed until the landscape was finished later that summer. On August 23, 2011, the Washington Monument sustained damage during the 5.8 magnitude 2011 Virginia earthquake; over 150 cracks were found in the monument. A National Park Service spokesperson reported that inspectors discovered a crack near the top of the structure, and announced that the monument would be closed indefinitely. A block in the pyramidion also was partially dislodged, and pieces of stone, stone chips, mortar, and paint chips came free of the monument and “littered” the interior stairs and observation deck. The Park Service said it was bringing in two structural engineering firms (Wiss, Janney, Elstner Associates, Inc. and Tipping Mar Associates) with extensive experience in historic buildings and earthquake-damaged structures to assess the monument. 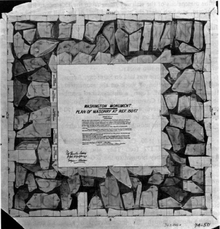 Officials said an examination of the monument’s exterior revealed a “debris field” of mortar and pieces of stone around the base of the monument, and several “substantial” pieces of stone had fallen inside the memorial.A crack in the central stone of the west face of the pyramidion was 1 inch (2.5 cm) wide and 4 feet (1.2 m) long. Park Service inspectors also discovered that the elevator system had been damaged, and was operating only to the 250-foot (76 m) level, but was soon repaired. On September 27, 2011, Denali National Park ranger Brandon Latham arrived to assist four climbers belonging to a “difficult access” team from Wiss, Janney, Elstner Associates. The reason for the inspection was the park agency’s suspicion that there were more cracks on the monument’s upper section not visible from the inside. The agency said it filled the cracks that occurred on August 23. After Hurricane Irene hit the area on August 27, water was discovered inside the memorial, leading the Park Service to suspect there was more undiscovered damage. The rappellers used radios to report what they found to engineering experts on the ground. Wiss, Janney, Elstner climber Dave Megerle took three hours to set up the rappelling equipment and set up a barrier around the monument’s lightning rod system atop the pyramidion; it was the first time the hatch in the pyramidion had been open since 2000. The external inspection of the monument was completed October 5, 2011. In addition to the 4-foot (1.2 m) long west crack, the inspection found several corner cracks and surface spalls (pieces of stone broken loose) at or near the top of the monument, and more loss of joint mortar lower down the monument. The full report was issued December 2011. Bob Vogel, Superintendent of the National Mall and Memorial Parks, emphasized that the monument was not in danger of collapse. “It’s structurally sound and not going anywhere”, he told the national media at a press conference on September 26, 2011. More than $200,000 was spent between August 24 and September 26 inspecting the structure. The National Park Service said that it would soon begin sealing the exterior cracks on the monument to protect it from rain and snow. On July 9, 2012, the National Park Service announced that the monument would be closed for repairs until 2014. The National Park Service hired construction management firm Hill International in conjunction with joint-venture partner Louis Berger Group to provide coordination between the designer, Wiss, Janney, and Elstner Associates, the general contractor Perini, and numerous stakeholders. NPS said a portion of the plaza at the base of the monument would be removed and scaffolding constructed around the exterior. In July 2013, lighting was added to the scaffolding. Some stone pieces saved during the 2011 inspection will be refastened to the monument, while “Dutchman patches”[n 5] will be used in other places. Several of the stone lips that help hold the pyramidion’s 2,000-pound (910 kg) exterior slabs in place were also damaged, so engineers will install metal brackets to more securely fasten them to the monument. The National Park Service reopened the Washington Monument to visitors on May 12, 2014, eight days ahead of schedule. Repairs to the monument cost US$15,000,000, with taxpayers funding $7.5 million of the cost and David Rubenstein funding the other $7.5 million. At the reopening Interior Secretary Sally Jewell, Today show weatherman Al Roker, and American Idol Season 12 winner Candice Glover were present. The monument continues to be plagued by problems since the earthquake, including in January 2017 when the lights illuminating it went out. The ceremony began with a parade of dignitaries in carriages, marching troops, fire companies, and benevolent societies. :chp 2:44–48:16–17, 45–47 A long oration was delivered by the Speaker of the House of Representatives Robert C. Winthrop. :113–130 Then, the cornerstone was pronounced sound after a Masonic ceremony using George Washington’s Masonic gavel, apron and sash, as well as other Masonic symbols. In attendance were President James K. Polk and other federal, state and local government officials, Elizabeth Schuyler Hamilton, Mrs. Dolley Madison, Mrs. John Quincy Adams, and George Washington Parke Custis, among 15,000 to 20,000 others, including a bald eagle. The ceremony ended with fireworks that evening. Another inscription, this one sent by the Ottoman government,:128 combines the works of two eminent calligraphers: an imperial tughra by Mustafa Rakım’s student Haşim Efendi, and an inscription in jalī ta’līq script by Kadıasker Mustafa İzzet Efendi, the calligrapher who wrote the giant medallions at Hagia Sophia in Istanbul. The four faces of the external aluminum apex all bear inscriptions in cursive writing (Snell Round hand), which are incised into the aluminum. The apex was inscribed on site after it was delivered. Most inscriptions are the original 1884 inscriptions, except for the top three lines on the east face which were added in 1934. A wide gold-plated copper band that held eight lightning rods covered most of the inscriptions from 1885 until it was removed and discarded in 2013. The inscriptions that it covered were damaged and are now illegible. Only the top four and bottom two lines of the north face, the first and last lines of the west face, the top four lines of the south face, and the top three lines of the east face are still legible. Even though the inscriptions are no longer covered, no attempt was made to repair them when the apex was accessible in 2013. The following table shows legible inscriptions in blue and illegible inscriptions in red. :93 No colors appear on the actual apex. George W. Davis, Captain, 14th Infantry. Bernard R. Green, Civil Engineer. A replica displayed on the 490-foot level uses totally different line breaks than those on the external apex—it also omits the 1934 inscriptions. In October 2007, it was discovered that the display of this replica was positioned so that the Laus Deo (Latin for “praise be to God”) inscription could not be seen and Laus Deo was omitted from the placard describing the apex. The National Park Service rectified the omission by creating a new display. Until it was removed, the original lightning protection system was connected to the tops of the four iron columns supporting the elevator with large copper rods. Even though the aluminum apex is still connected to the columns with large copper rods, it is no longer part of the lightning protection system because it is now disconnected from the present lightning rods which shield it. The two lightning rods present since 2013 are connected to the iron columns with two large braided aluminum cables leading down the surface of the pyramidion near its southeast and northwest corners. They enter the pyramidion at its base, where they are tied together (electrically shorted) via large braided aluminum cables encircling the pyramidion two feet (0.6 m) above its base. The bottom of the iron columns are connected to ground water below the monument via four large copper rods that pass through a 2-foot (0.6 m) square well half filled with sand in the center of the foundation. The effectiveness of the lightning protection system has not been affected by a significant draw down of the water table since 1884 because the soil’s water content remains roughly 20% both above and below the height of the water table. During the first phase of construction (1848–54), the walls were built with bluestone gneiss rubble, ranging from very large irregular stones having a cross section of about 5 by 10 feet (1.5 m × 3.0 m)) down to spalls (broken pieces of stone) all embedded in a large amount of mortar. The outer surface is marble stones 14 to 18 inches (36–46 cm) thick in 2-foot (61 cm) high courses or rows horizontally encircling the monument. Although each course contains both stretchers (stones parallel to the wall) and headers (stones projecting into the wall), about two to three times as many stretchers as headers were used. Their joints were so thin that some stones pressed on bare stone below them, breaking off many pieces since it was constructed. The batter or slope of the outer surface is 0.247 inches per foot (2.06 cm/m, 1°11′). The inner surface has disorderly rows of smaller roughly dressed bluestone gneiss. :B-49:sheets 7–30:18–19, 23, 105–6 The base of the first phase walls has an outer dimension of 55 feet 1 1⁄2 inches (16.80 m) square and a thickness of 15 feet (4.57 m). The interior well is 25 feet 1 inch (7.65 m) square and has square corners. The weight of the first phase walls up to 150 feet (45.7 m) is 22,373 long tons (25,058 short tons; 22,732 tonnes). During the second phase (1879–84), the walls were constructed of smoothly dressed (ashlar) large marble and granite blocks (rectangular cuboids) laid down in an orderly manner (Flemish bond) with thick joints. Two-foot high marble surface stones, using an equal number of stretchers and headers, were backed by granite blocks from the 152-foot level (the first course above the rubble) to the 218-foot level, where marble headers become increasingly visible on the internal surface of the walls up to the 450-foot level, above which only marble stones are used. [n 7] Between the 150- and 160-foot levels the inner walls rapidly slope outward, increasing the shaft well from 25 feet 1 inch square to 31 feet 5 1⁄2 inches (9.59 m) square with a corresponding decrease in the thickness of the walls and their weight. :sheets 4–5:23 The second phase walls at the 160-foot level were 8 feet 7 1⁄2 inches (2.63 m) thick, which, combined with the larger shaft well, yields an outer dimension of 48 feet 8 1⁄2 inches (14.85 m) square at that level. The top of the second phase walls are 34 feet 5 1⁄2 inches (10.50 m) square and 1 foot 6 inches (46 cm) thick. :3-7 The second phase interior walls have rounded (2-foot (0.61 m) radii) corners. The weight of the second phase walls (from 150 feet to 500 feet) are 21,260 long tons (23,810 short tons; 21,600 tonnes). The walls of the entire shaft (combined first and second phases) are 500 feet 5 1⁄8 inches (152.530 m) high. The first phase of the walls was constructed under the direction of William Dougherty. Its white marble exterior came from the Texas quarry now adjacent to and east of north I-83 near the Warren Road exit in Cockeysville, Maryland. The quarry was named for the Texas Station (no longer extant) and 19th-century town on the Northern Central Railway. During the first phase it was operated by Thomas Symington, but is now operated by Lafarge and no longer produces building stone. The second phase of construction was under the direction of Lt Col/Col Thomas Lincoln Casey of the U.S. Army Corps of Engineers, who removed two defective courses added by the Know-Nothings and the last 152-foot course added by Dougherty before Casey began his construction. The next three courses of white marble (152–156 feet (46–48 m)) came from Sheffield, Massachusetts, while all courses above them came from the Beaver Dam quarry just west of the 19th-century town of Cockeysville. :63 The latter quarry is located on Beaver Dam Road near its intersection with McCormick Road. During the second phase the quarry was operated by Hugh Sisson, but is now flooded, is called Beaverdam Pond, and is the home of the Beaver Dam Swimming Club. Both 19th-century towns are now within the city limits of Cockeysville. During the second phase, after determining that the proposed weight of the monument was too great for the old foundation to safely bear, the thickness of the walls atop the unfinished stump was reduced and the foundation was strengthened by adding a large unreinforced concrete slab below the perimeter of the old foundation to increase the monument’s load bearing area two and one half times. The slab was 13 feet 6 inches (4.11 m) thick, with an outer perimeter 126 feet 5 1⁄2 inches (38.54 m) square, an inner perimeter 44 feet (13.41 m) square, with undisturbed loam inside the inner perimeter except for the water well. The area at the base of the second phase foundation is 15,992 square feet (1,485.7 m2). The strengthened foundation (old foundation and concrete slab) has a total depth of 36 feet 10 inches (11.23 m) below the bottom of the lowest course of marble blocks (now below ground), and 38 feet (11.58 m) below the entry lobby floor. Casey reported that nowhere did the load exceed 9 long tons per square foot (140 psi; 970 kPa) and did not exceed 3 long tons per square foot (47 psi; 320 kPa) near the outer perimeter. To properly distribute the load from the shaft to slab, about half by volume of the outer periphery of the old rubble foundation below its top step was removed. A continuous sloping unreinforced concrete buttress encircles what remains. The buttress is 100 feet 4 inches (30.58 m) square at its base, 64 feet 6 inches (19.66 m) square at its top, and 20 feet 5 inches (6.22 m) high. The perimeter of the original top step of the old rubble foundation rests on the larger top of the concrete buttress. Its slope (lower external angle from the vertical) is 49°. This buttress rests in a depression (triangular cross-section) on the top surface of the concrete slab. The slab was constructed by digging pairs of 4-foot (1.2 m) wide drifts on opposite sides of the monument’s center line to keep the monument properly balanced. The drifts were filled with unreinforced concrete with depressions or dowel stones on their sides to interlock the sections. :3-3–3-5, figs 3.1–3.6, 3.9, 3.13, 4.11:39, 47–48, 67–73 An earthen terrace 60 feet (18 m) wide with its top at the base of the walls and steep sides was constructed in 1880–81 over the reinforced foundation while the rest of the monument was being constructed. During 1887–88, a knoll was constructed around the terrace roughly 300 feet (91 m) wide that tapered into the surrounding terrain. This earthen terrace and knoll serves as an additional buttress for the foundation. The weight of the foundation is 36,912 long tons (41,341 short tons; 37,504 tonnes),including earth and gneiss rubble above the concrete foundation that is within its outer perimeter. North interior wall with its stairs and their wire screening. The main stairs spiral up the interior walls from the entry lobby floor to the elevator reboarding floor at the 490-foot level. The elevator occupies the center of the shaft well from the entry lobby to the observation floor, with an elevator machine room (installed 1925–26) whose floor is 18 feet 10 inches (5.74 m) above the observation floor and an elevator pit (excavated 1879) whose floor is 9 feet (2.74 m) below the entry lobby floor. :sheet 31–35:61, 74 The stairs and elevator are supported by four wrought iron columns each. The four supporting the stairs extend from the entry lobby floor to the observation floor and were set at the corners of a 15-foot-8-inch (4.78 m) square. The four supporting the elevator extend from the floor of the elevator pit to 14 feet (4.3 m) above the observation floor and were set at the corners of a 9-foot-9 1⁄2-inch (2.98 m) square. :3-6 The weight of the ironwork is 275 long tons (308 short tons; 279 tonnes). Cast iron, wrought iron, and steel were all used. The two small spiral stairs installed in 1958 are aluminum. Most landings occupy the entire east and west interior walls every 10 feet from and including the east landing at the 30-foot level up to the west landing at the 480-foot level, east then west alternately. Three stairs with small landings rise from the entry lobby floor to the 30-foot level successively along the north, west and south interior walls. Landings from the 30-foot level up to the 150-foot level are 3 feet 2 1⁄4 inches by 25 feet 1 inch, while landings from the 160-foot level to the 480-foot level are 7 feet 10 3⁄4 inches (2.41 m) by 31 feet 5 1⁄2 inches (9.59 m). All stairs are on the north and south walls except for the aforementioned west stair between the 10- and 20-foot levels, and the two spiral stairs. The total cost of the monument from 1848 to 1888 was $1,409,500. The weight of the above ground portion of the monument is 44,208 long tons (49,513 short tons; 44,917 tonnes), whereas its total weight, including the foundation below ground and any earth above it that is within its outer perimeter is 81,120 long tons (90,854 short tons; 82,422 tonnes). The total number of blocks in the monument, including all marble, granite and gneiss blocks, whether externally or internally visible or hidden from view within the walls or old foundation is over 36,000. The number of marble blocks externally visible is about 10,000. Overhead view showing all 50 American flags. In 2001, a temporary visitor security screening center was added to the east entrance of the Washington Monument in the wake of the September 11 attacks. The one-story facility was designed to reduce the ability of a terrorist attack on the interior of the monument, or an attempt to seize and hold it. Visitors obtained their timed-entry tickets from the Monument Lodge east of the memorial, and passed through metal detectors and bomb-sniffing sensors prior to entering the monument. After exiting the monument, they passed through a turnstile to prevent them from re-entering. This facility, a one-story cube of wood around a metal frame, was intended to be temporary until a new screening facility could be designed. On March 6, 2014, the National Capital Planning Commission approved a new visitor screening facility to replace the temporary one. The 785-square-foot (72.9 m2) facility will be two stories high and contain space for screening 20 to 25 visitors at a time. The exterior walls (which will be slightly frosted to prevent viewing of the security screening process) will consist of an outer sheet of bulletproof glass or polycarbonate, a metal mesh insert, and another sheet of bulletproof glass. The inner sheet will consist of two sheets (slightly separated) of laminated glass. A 0.5-inch (1.3 cm) airspace will exist between the inner and outer glass walls to help insulate the facility. Two (possibly three) geothermal heat pumps will be built on the north side of the monument to provide heating and cooling of the facility. The new facility will also provide an office for National Park Service and United States Park Police staff. The structure is designed so that it may be removed without damaging the monument. The United States Commission of Fine Arts approved the aesthetic design of the screening facility in June 2013. A recessed trench wall known as a ha-ha has been built to minimize the visual impact of a security barrier surrounding the monument. After the September 11 attacks and another unrelated terror threat at the monument, authorities had put up a circle of temporary Jersey barriers to prevent large motor vehicles from approaching. The unsightly barrier was replaced by a less-obtrusive low 30-inch (0.76 m) granite stone wall that doubles as a seating bench and also incorporates lighting. The installation received the 2005 Park/Landscape Award of Merit from the American Society of Landscape Architects. The Washington Monument is served by the Smithsonian metro station, located on Independence Avenue. As a landmark of the U.S. capital, the Washington Monument has been featured in film and television depictions. The symbolic meaning of the shape is referenced in the novel The Lost Symbol by Dan Brown. The monument is also the subject of Carl Sandburg‘s 1922 poem, “Washington by Night”. The Lincoln Memorial, Washington Monument, and United States Capitol together are a typical establishing shot for Washington, D.C.
2003 view of monument, surrounded by a ring of Jersey barriers. The White House is visible at the upper right. The Lincoln Memorial is beyond the frame, at left. Jump up^ Several heights have been specified, all of which exclude the foundation whose top is 17 feet (5.2 m) above the pre-construction ground level. The foundation is surrounded by a grassy knoll which effectively places the foundation below ground level. This knoll serves as a buttress for the foundation. 554 feet 7 11⁄32 inches (169.046 m) according to the National Geodetic Survey (NGS):5 using the criteria of the Council on Tall Buildings and Urban Habitat (CTBUH), that is, from the “level of the lowest, significant, open-air, pedestrian entrance” to the highest point of the building. From among four candidate points suggested by the NGS, the CTBUH chose a point on the entry ramp installed in 1975 where it crosses the outer face of the marble facade of the monument. :7:2-15, 3-18, 4-13, B-49, figs 3.32, 3.33, 3.39, 3.42:sheet 31 Measured 2013–14 and reported February 16, 2015. This is also its new above ground height because the ground at the shaft was raised in 1975 to match the ramp. The ground surrounding the shaft was replaced by granite pavers during 2004–05 to match the raised ground level and the ramp. This height is 22.0 centimeters (8.66 in) above four “CASEY marks”, 2.5-inch (6.4 cm) diameter brass bolts inserted vertically into the topmost level of the foundation just outside the four corners of the monument and set flush with the lower surface of the marble blocks, that the NGS thinks were likely used by Col. Thomas Lincoln Casey, the engineer in charge of construction, to determine the traditional height in 1884. The floor at the elevator is now 13.9 centimeters (5.47 in) above this pedestrian entrance, and 35.9 centimeters (14.13 in) above the CASEY marks. :13, 56, 65, 82–84 The highest point of the monument is a one millimeter diameter dimple atop the aluminum apex. 555 feet 5 1⁄8 inches (169.294 m) according to the National Park Service. Measured and reported in 1884 by Col. Thomas Lincoln Casey, the engineer in charge of construction. It was measured from the top of the foundation (the lowest marble joint or the door-sills of the two empty doorways), which was in place in 1884. This is the traditional height of the monument that became moot when the pavement or ground next to the monument was raised in 1975. 554 feet 11 1⁄2 inches (169.151 m) according to architectural drawings in the Historic American Buildings Survey (1994), pavement at shaft to tip. :sheets 7, 31 This height is comparable to the NGS height because it was also determined after the ramp was installed in 1975. Jump up^ Two other monumental columns (honoring someone or something) have heights comparable to that of the Washington Monument, the San Jacinto Monument in Texas and the Juche Tower in North Korea. Which of the three is taller depends on how its height is measured. A traditional method is above a part of the monument comparable to ground level. A more recent method is that used by the Council on Tall Buildings and Urban Habitat (CTBUH), the arbiter of the height of tall buildings since 1969. The CTBUH states the height of a building must be measured above the “level of the lowest, significant, open-air, pedestrian entrance”. The three CTBUH (above pedestrian entrance) heights from tallest to shortest are the Washington Monument, the San Jacinto Monument (−2.6 feet (−0.79 m)), and the Juche Tower (−20 feet (−6 m)). The above ground heights of the three monumental columns from tallest to shortest are the San Jacinto Monument (+12.70 feet (3.871 m)), the Juche Tower (3.3 feet (+1 m)), and the Washington Monument. Height differences are relative to the height of the Washington Monument. The Washington Monument’s CTBUH (above pedestrian entrance) height, 554 feet 7 11⁄32 inches (169.046 m), is the same as its above ground height. The San Jacinto Monument has a surveyed height of 567.31 feet (172.916 m) from its footing to the top of its beacon. However, the architect of the monument, Albert C. Finn, stated, “San Jacinto … is actually 552 feet (168.2 m) from the first floor to the top of the beacon” … in the “customary way” of measuring such things. The “first floor” is the CTBUH criterion. A stepped terrace elevates this pedestrian entrance above ground, thus reducing the monument’s remaining height by its thickness, about 15.5 feet (4.7 m), to the monument’s CTBUH height. The monument is made of reinforced concrete, not stone, although it has a facade of limestone. The Juche Tower has a specified height of 558 feet (170 m) above a very large concrete bus parking lot just east of the tower. A stepped terrace elevates its pedestrian entrance, also on its east side, above this ground level. Its thickness, 23 feet (7 m), reduces the remaining height of the tower to 535 feet (163 m), its CTBUH height. The tower is made of reinforced concrete, not stone, although it has a facade of granite. A metal cage holding many panels of red glass in the shape of a flame, internally illuminated at night, surmounting a gold-colored “fuel chamber”, occupies its top 66 feet (20 m). ^ Jump up to:a b The Anaconda Smelter Stack consists entirely of brick, although it is reinforced by steel bands encircling most of its height. It is 585 feet (178 m) tall, excluding a concrete base. Masonry, by definition, includes manufactured brick as well as natural stone. Taller stacks or chimneys are made of reinforced concrete. See the list of tallest towers (designed for regular public access), and the list of tallest chimneys (not designed for regular public access). Jump up^ The Carthage stone was the last memorial stone installed in the monument, in 2000. 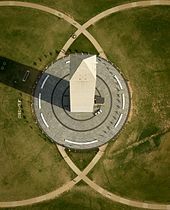 ^ Jump up to:a b c d e f g h i j National Geodetic Survey, “2013–2014 Survey of the Washington Monument” Archived March 3, 2016, at the Wayback Machine., 2015. Horizontal coordinates converted from NAD83(2011) to WGS84(G1674), the required coordinate system for Wikipedia coordinates, via NGS Horizontal Time-Dependent Positioning, epoch 2010.0 including ellipsoidal height. ^ Jump up to:a b Wunsch, Aaron V. (1994). Historic American Buildings Survey, Washington Monument, HABS DC-428 (text) (PDF). National Park Service. ^ Jump up to:a b “CTBUH Criteria for Defining and Measuring Tall Buildings”. ctbuh.org. Jump up^ National Geodetic Survey, “Why does the value obtained in 2014 … disagree with the 1884 value …?” Archived March 4, 2016, at the Wayback Machine., 2015, picture of precise spot used. ^ Jump up to:a b c d e f g h i j k l m n Arzola, Robert R.; Lockett, Dana L.; Schara, Mark; Vazquez, Jose Raul (1994). Historic American Buildings Survey, Washington Monument, HABS DC-428 (drawings). National Park Service. ^ Jump up to:a b “Frequently Asked Questions about the Washington Monument by the National Park Service”. Nps.gov. Retrieved January 31, 2013. ^ Jump up to:a b c d e f g h i j Thos. Lincoln Casey, “report of operations upon the Washington Monument for the year ” in Letter from William W. Corcoran, Chairman of the Joint Commission for the Completion of the Washington Monument, transmitting the annual report of the Commission, December 19, 1884, U.S. Congressional Serial Set, Vol. 2310, 48th Congress, 2nd Session, House of Representatives Misc. Doc. 8, p. 5. Available for free in most large United States libraries in government documents or online. Establish a connection to Readex collections before clicking on link. ^ Jump up to:a b c d e George J. Binczewski (1995). 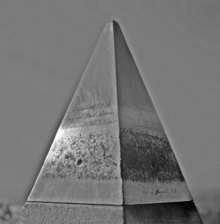 “The Point of a Monument: A History of the Aluminum Cap of the Washington Monument”. JOM. 47 (11): 20–25. doi:10.1007/bf03221302. ^ Jump up to:a b c “Aerial America: Washington D.C.”. Aerial America. Smithsonian channel. Jump up^ Fitzgerald, Desmond (February 28, 1885). “The Washington Monument”. American Architect and Building News. XVII (429): 102–3. ^ Jump up to:a b Kelly, John (June 19, 2013). “Local: The Washington Monument is tall, but is it the tallest?”. Washington Post. Retrieved December 26, 2016. ^ Jump up to:a b Marking a people’s love, an article from The New York Times published February 22, 1885. Jump up^ “”Washington Monument Remains Closed Indefinitely.” ”Associated Press.””. Photoblog.msnbc.msn.com. August 23, 2011. Archived from the original on April 25, 2012. Retrieved January 31, 2013. ^ Jump up to:a b “Washington Monument reopening”. National Park Service. Retrieved May 12, 2014. Jump up^ “Photos From the Top of the Washington Monument Reopening”. I Hit The Button. 2014-05-13. Retrieved 2016-05-06. ^ Jump up to:a b c “Washington Monument reopens after quake repairs”. CNN.com. 2011-08-23. Retrieved 2014-05-14. ^ Jump up to:a b “10 Facts About the Washington Monument as It Reopens”. ABC News. Retrieved 2014-05-14. ^ Jump up to:a b “Washington Monument draws crowds as it reopens after renovations”. Los Angeles Times. Retrieved 2014-05-14. Jump up^ Hedgpeth, Dana; Ruane, Michael E. (September 26, 2016). “Washington Monument closed indefinitely over elevator’s ‘reliability issues'”. The Washington Post. Retrieved September 26, 2016. Jump up^ “David Rubenstein Donates Funds to Modernize Washington Monument Elevator – National Mall and Memorial Parks (U.S. National Park Service)”. www.nps.gov. Retrieved 2016-12-02. Jump up^ Ambrose, Stephen E. (November 2002). “Founding Fathers and Slaveholders”. Smithsonian Magazine. Retrieved February 16, 2015. Jump up^ Paul K. Longmore (1999). The Invention of George Washington. Univ. of Virginia Press. p. 207. ISBN 978-0-8139-1872-3. Retrieved February 16, 2015. Jump up^ Sheldon S. Cohen, “Monuments to Greatness: George Dance, Charles Polhill, and Benjamin West’s Design for a Memorial to George Washington.” Virginia Magazine of History and Biography, April 1991, Vol. 99 Issue 2, pp. 187–203. JSTOR 4249215 ISSN 0042-6636. Retrieved February 16, 2015. Jump up^ George Cochrane Hazelton, The national capitol: its architecture, art and history (1902) p. 288. ^ Jump up to:a b “The Washington Monument: Tribute in Stone”. National Park Service, ParkNet. ^ Jump up to:a b United States nominal Gross Domestic Product per capita figures follow the Measuring Worth series supplied in Johnston, Louis; Williamson, Samuel H. (2016). “What Was the U.S. GDP Then?”. MeasuringWorth. Retrieved April 10, 2016. These figures follow the figures as of 2015. ^ Jump up to:a b c d e f g h Olszewski, George J. (1971). 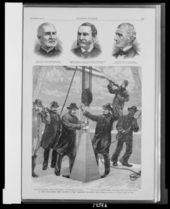 “A History of the Washington Monument, 1844–1968, Washington, D.C.”. Washington, D.C.: National Park Service. ^ Jump up to:a b “The Washington Monument: Tribute in Stone, Reading 3”. National Park Service. Retrieved August 12, 2011. 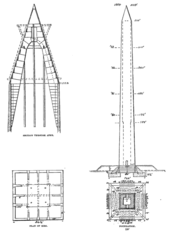 Jump up^ “Drawing 1: Robert Mills’s design for the Washington Monument. Photo 1: The Washington Monument today.” Archived March 12, 2016, at the Wayback Machine., National Park Service. Accessed 2015-03-07. Jump up^ Download Conversion Factors Archived August 29, 2016, at the Wayback Machine. Oregon State University. ^ Jump up to:a b c d e f g h i j k l m n o p q r s t u Louis Torres, “To the immortal name and memory of George Washington”: The United States Army Corps of Engineers and the Construction of the Washington Monument Archived June 24, 2016, at the Wayback Machine., (Washington, D.C.: US Government Printing Office, 1984). Jump up^ Bowling, Kenneth R (2002). Peter Charles L’Enfant: vision, honor, and male friendship in the early American Republic. George Washington University, Washington, D.C.
Jump up^ “Washington Monument” section in “Washington, D.C.: A National Register of Historic Places Travel Itinerary” page in official website of U.S. National Park Service. Retrieved October 22, 2009. Jump up^ “Washington Monument” page in “American Presidents” section of official website of U.S. National Park Service. Retrieved October 22, 2009. Jump up^ “Data Sheet Retrieval”. noaa.gov. Jump up^ Pfanz, Donald C., National Park Service, National Capital Region (December 2, 1980). “Jefferson Pier Marker” (PDF). National Register of Historic Places Inventory – Nomination Form: Washington Monument. United States Department of the Interior: National Park Service. p. Continuation Sheet, Item No. 7, p. 4. Retrieved February 13, 2012. ^ Jump up to:a b c d Reeves, Thomas C. (February 1975). Gentleman Boss. New York, NY: Alfred A. Knopf. p. 413. ISBN 978-0-394-46095-6. ^ Jump up to:a b c d e f g h i j k Frederick L. Harvey, History of the Washington National Monument and Washington National Monument Society, Congressional Serial Set, volume 4436, 57th Congress, 2nd session, Senate Doc. 224, 1903. This 1903 edition is about three times the size of the 1902 edition, which has the slightly different name History of the Washington National Monument and of the Washington National Monument Society Archived September 3, 2016, at the Wayback Machine.. The 1903 edition is available for free in most large United States libraries in government documents or online. Establish a connection to Readex collections before clicking on 1903 link. ^ Jump up to:a b “Reading 2: Construction of the Monument”. National Park Service. Retrieved 10 March 2015. Jump up^ Perry, John (2010). Lee: A Life of Virtue. Nashville, Tennessee: Thomas Nelson. pp. 93–94. ISBN 1595550283. OCLC 456177249. At Google Books. ^ Jump up to:a b c d e f g h i j k l m n o Judith M. Jacob, The Washington Monument: A technical history and catalog of the commemorative stones Archived June 20, 2015, at the Wayback Machine., 2005. Jump up^ “Washington Monument”. National Park Service. Retrieved 10 March 2015. The walls of the monument range in thickness from 15′ at the base to 18 at the upper shaft. They are composed primarily of white marble blocks from Maryland with a few from Massachusetts, underlain by Maryland blue gneiss and Maine granite. A slight color change is perceptible at the 150′ level near where construction slowed in 1854. Jump up^ “Hall Process: Production and Commercialization of Aluminum”. National Historic Chemical Landmarks. American Chemical Society. Retrieved March 25, 2013. Jump up^ “Washington Monument” Archived December 27, 2014, at the Wayback Machine.. Teaching with Historic Places. National Park Service. Retrieved October 15, 2006. ^ Jump up to:a b Crutchfield, James A. (2005). George Washington: First in War, First in Peace. New York, N.Y.: A Forge Book: Tom Doherty Associates, LLC. p. 218. ISBN 0765310694. OCLC 269434694. ^ Jump up to:a b The Dedication of the Washington National Monument, 1885. Jump up^ Reeves, Thomas C. (February 1975). Gentleman Boss. NY, NY: Alfred A. Knopf. p. 414. ISBN 978-0-394-46095-6. Jump up^ “Washington Monument”. Emporis.com. Retrieved 2008-07-06. Jump up^ “Washington Monument”. SkyscraperPage.com. Retrieved 2008-07-10. Jump up^ “Primary Acts passed by U.S. Congress”. Loislaw. Retrieved 2008-08-04. Jump up^ Edward Chaney, “Roma Britannica and the Cultural Memory of Egypt: Lord Arundel and the Obelisk of Domitian”, in Roma Britannica: Art Patronage and Cultural Exchange in Eighteenth-Century Rome, eds. D. Marshall, K. Wolfe and S. Russell, British School at Rome, 2011, pp. 147–70. Jump up^ “Determining the Facts Reading 3: Finishing the Monument”. nps.gov. Retrieved 15 January 2015. Jump up^ “Monthly Visitors to the Washington Monument”. The New York Times. August 24, 2011. Retrieved 15 January 2015. Jump up^ National Park Service (2007-01-23). “National Register Information System”. National Register of Historic Places. National Park Service. Jump up^ “Washington Monument attacked by Geological Tuberculosis” ArchivedSeptember 2, 2016, at the Wayback Machine. Popular Mechanics, December 1911, pp. 829–830. This source mistakenly said the lower 190 feet was constructed during the early period—it was actually 150 feet. Jump up^ Jeffrey David Simon (2001). The Terrorist Trap: America’s Experience with Terrorism. Indiana UP. p. 285. Jump up^ Gabriel Escobar (December 30, 1998). “Obelisk’s Scaffold Is First of Its Kind”. Washington Post. Retrieved June 13, 2011. ^ Jump up to:a b Linda Wheeler (July 30, 2000). “It’s Ready for Its Close-Up Now: Big Crowds Are Expected For Monument’s Reopening”. The Washington Post. Jump up^ “Metro in Brief”. The Washington Post. August 30, 2000. Jump up^ John Heilprin (February 23, 2002). “New sight from Washington Monument”. Deseret News. Retrieved June 13, 2011. Jump up^ “Washington Monument reopens to public”. USA Today. April 1, 2005. Retrieved June 9, 2011. Jump up^ Paul Schwartzman (March 19, 2005). “Washington Monument To Reopen Next Month”. The Washington Post. Retrieved June 9, 2011. Jump up^ FoxNews.com (August 23, 2011). “Disasters Washington Monument Indefinitely Closes After Earthquake Causes Cracks”. Fox News. Retrieved August 23, 2011. ^ Jump up to:a b c d e Michael E. Ruane (September 26, 2011). “Washington Monument Elevator Damage Inspected as Earthquake’s Toll Is Assessed”. Washington Post. Retrieved January 31, 2013. Jump up^ Sullivan, Patricia. “Washington Monument Cracks Indicate Earthquake Damage.”Washington Post. August 25, 2011. Assessed August 26, 2011. Jump up^ “Washington Monument Finds Additional Cracks.” Press release. National Park Service. U.S. Department of the Interior. August 25, 2011 Archived May 2, 2014, at the Wayback Machine.. Retrieved August 26, 2011. ^ Jump up to:a b c Nuckols, Ben. “Weather May Delay Washington Monument Rappelling”Associated Press. September 27, 2011. ^ Jump up to:a b c O’Toole, Molly. “Engineers to Rappel Down Washington Monument to Inspect Damage”. Reuters.com. Retrieved January 31, 2013. Jump up^ Clark, Charles S. (August 21, 2012). “Washington Monument Elevator Woes”. Government Executive. Retrieved January 31, 2013. ^ Jump up to:a b Smith, Markette (September 26, 2011). “Climbers Rappel Washington Monument to Assess Damage”. Wamu.org. Retrieved January 31, 2013. ^ Jump up to:a b c “Post-Earthquake Assessment” (PDF). www.nps.gov. National Park Service. December 22, 2011. Retrieved January 4, 2016. Jump up^ Cohn, Alicia. “Washington Monument could be closed until 2014 for earthquake repairs”. The Hill. Retrieved July 9, 2012. ^ Jump up to:a b “Washington Monument Earthquake Repair”. CMAA. 2014-05-01. Retrieved 2015-07-15. Jump up^ Freed, Benjamin R. “Washington Monument Nearly Topped Out, Will Be Lighted in June”. Retrieved May 9, 2013. Jump up^ Grimmer, Anne E., “Dutchman Repair” (1984),A Glossary of Historic Masonry Deterioration Problems and Preservation Treatments. Washington, D.C.: Department of the Interior, National Park Service Preservation Assistance Division. p. 56. Retrieved April 3, 2013. Jump up^ “Inscription at level 330 – Washington Monument, High ground West of Fifteenth Street, Northwest, between Independence & Constitution Avenues, Washington, District of Columbia, DC”. loc.gov. Jump up^ The Cambrian, vol. XVII, p. 139. 1897. Jump up^ “Sister Monuments : Hagia Sophia and Washington Monument”. (not to be) Missed Turkey & Istanbul Sites and Facts. Jump up^ Kerr, George H. Okinawa: The History of an Island People. (revised ed.) Tokyo: Tuttle Publishing, 2003. p337n. Jump up^ Ferling, John E. (1988). The First of Men: A Life of George Washington. New York: Oxford University Press. p. 488. ISBN 0199742278. Retrieved 2015-08-22. ^ Jump up to:a b [Thomas Lincoln Casey], Letter from the Joint Commission for Completion of the Washington Monument, transmitting their annual report. December 15, 1885Congressional Serial Set, volume 2333, 49th Congress, 1st session, Senate Doc. 6. Available for free in most large United States libraries in government documents or online. Establish a connection to Readex collections before clicking on link. Jump up^ External apex east and north faces Archived October 9, 2016, at the Wayback Machine. Jump up^ External apex west and south faces Archived May 15, 2016, at the Wayback Machine. Jump up^ “A Monumental Omission”. Nationaltreasures.org. Retrieved January 31, 2013. Jump up^ M., “The Washington Monument, and the Lightning Stroke of June 5”Archived September 2, 2016, at the Wayback Machine., Science 5 (1885) 517–518. Jump up^ Gabriel Escobar, “Workers prepare to fill a tall order”, Washington Post Tuesday, October 13, 1998, page B1. Jump up^ Jean-Louis Briaud et al, “The Washington Monument case history” ArchivedAugust 1, 2016, at the Wayback Machine., International Journal of Geoengineering Case Histories 1 (2009) 170–188, pp. 176–179. ^ Jump up to:a b “1993 Evaluation of the Washington Monument (1 of 5)”. National Park Service. Jump up^ Google (January 31, 2013). “Marble quarries near Cockeysville, MD” (Map). Google Maps. Google. Retrieved January 31, 2013. Jump up^ William D. Purdum (March 5, 1940). “The history of the marble quarries in Baltimore County, Maryland” (PDF). Retrieved June 27, 2014. Jump up^ “Washington Monument Seismic Report without appendices”. Washington Monument Seismic Study. National Park Service. pp. 10–16. Retrieved 14 June 2016. 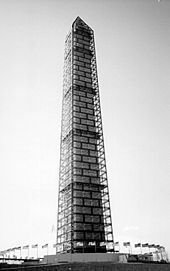 ^ Jump up to:a b Charles W. Snell, A Brief History of the Washington Monument and Grounds, 1783–1978 Archived June 20, 2015, at the Wayback Machine. (1978) 17–19. Jump up^ Michael D. Hoover, The origins and history of the Washington Monument flag display, 1992 Archived June 20, 2015, at the Wayback Machine. Jump up^ National Park Service and National Capital Planning Commission. “Visitor Screening Facility, Washington Monument Between 14th and 17th Streets, NW and Constitution Avenue, NW and the Tidal Basin.” Executive Director’s Recommendation. NCPC File Number 6176. March 6, 2014, pp. 5, 7Archived March 4, 2016, at the Wayback Machine.. Retrieved March 7, 2014. Jump up^ Neibauer, Michael. “Here’s Where You’ll Queue to Visit the Washington Monument.” Washington Business Journal. March 7, 2014 Archived August 29, 2016, at the Wayback Machine.. Retrieved March 7, 2014. Jump up^ National Park Service and National Capital Planning Commission. “Visitor Screening Facility, Washington Monument Between 14th and 17th Streets, NW and Constitution Avenue, NW and the Tidal Basin.” Executive Director’s Recommendation. NCPC File Number 6176. March 6, 2014, pp. 15-16Archived March 4, 2016, at the Wayback Machine.. Retrieved March 7, 2014. Jump up^ Risk Management Series: Site and Urban Design for Security. U. S. Department Security, Federal Emergency Agency. pp. 4–17. Jump up^ Christopher Hodapp (January 13, 2010). Deciphering the Lost Symbol: Freemasons, Myths and the Mysteries of Washington. Ulysses Press. ISBN 978-1-56975-773-4. Jump up^ Sandburg, Carl. “Washington Monument by Night”. The National Parks: Index 2001–2003. Washington, D.C.: U.S. Department of the Interior. Wikisource has the text of the 1905 New International Encyclopedia article Washington Monument. “Trust for the National Mall: Washington Monument”. Trust for the National Mall. This page was last modified on 24 January 2017, at 02:29.